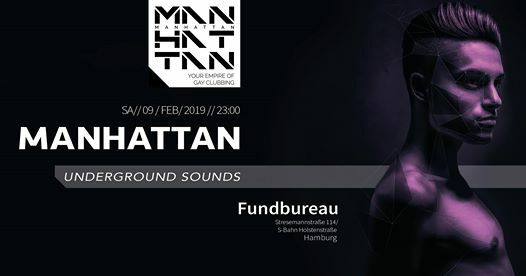 Our friends of MANHATTAN Gay Event are celebrating this special party every 2 months together with you at the Fundbureau! Fundbureau in HAMBURG is located directly on the Sternbrücke , corner Stresemannstr./Max-BrauerAllee. You can expect 2 floors – on the Mainfloor all friends of Electronic Dance Music (Techhouse // Techno) will enjoy themself, while you can dance on the Barfloor to Pop // Rnb & Charts! On all floors, both our Resident DJs and changing guest DJs are on! All current information, dates and tickets are on the Facebook page or visit the website!